“BRING ME A NAIL and a hammer and a picture to hang on the wall. Bring me a strong step ladder for you know that I might fall. Send in a couple of waiters with a bottle of good old bass ale - and I guess I'll hang that picture if somebody drives the nail" – old song, author unknown. 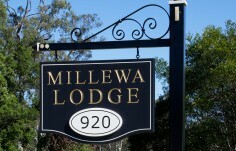 Hang out your 'shingle' sign - it's not so hard - Danthonia does most of the work! 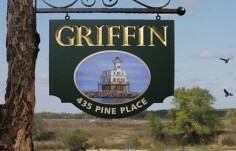 Traditional shingle signs hang from a metal scroll or wooden beam and are often two sided signs positioned perpendicular to the road or sidewalk. People can see your sign both coming and going. This positioning allows a longer time for people to recognize your sign and read its message. The extra side usually adds double visibility but only about 50% to the total price so this choice is good value for money. 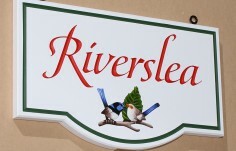 Although hand carved hanging signs have been used by shops and businesses for centuries - this section of our website specifically features hanging signs for home, property and estate branding. 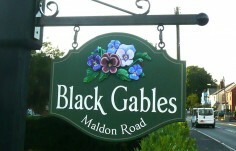 Our sign products look like traditionally chisel carved and hand painted wood signage, but the materials we use are much more weatherproof than wood. 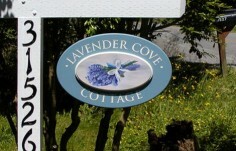 Our hanging house sign panels are HDU front and back laminated to a firm PVC core. They do not warp, split, crack or rot like wood when hanging out in the elements. The HDU is similar in density to a soft wood like redwood or cedar. It carves, gilds and paints like a soft wood while the firmer PVC core is excellent for holding the hanging hardware even in strong winds. 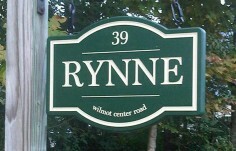 Look through the photos of the many hanging house signs that we have made for other clients and find one that you like. Use the tools on our website to tweak the design until it is just right for you. 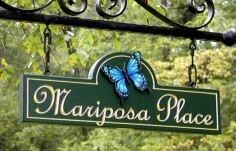 One thing to keep in mind when you are choosing artwork for your hanging sign is that a small subject like a leaf or a flower will be enlarged onto your sign and recognized from quite far away. 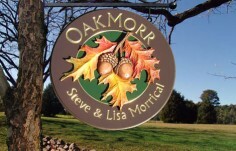 Where as a stand of giant oak trees or a detailed landscape scene will need to be reduced to fit onto your sign and may then be difficult for the viewer to resolve from a distance. 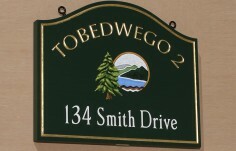 So when planning your sign art first determine if your viewers will be walking close by your sign or driving by at high speed and looking from a distance. 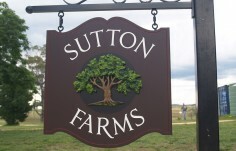 When you order on line you can choose eye bolts if you already have a place to hang your sign from - or a scroll hanger if you would like us to supply one tailored for the size of sign you are purchasing. 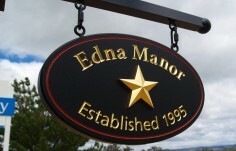 Danthonia offers hand crafted scroll hangers that accommodate any sign up to a width of 32" . These scrolls have the historic look of wrought iron hangers but are hand crafted from light weight and rust-free powder-coated aluminum. 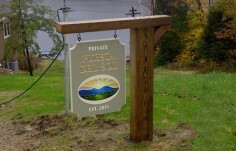 They are engineered to hold your sign securely in wind and weather. 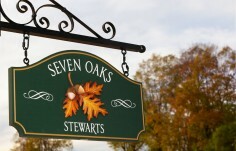 Scroll hangers can be added to your sign order at checkout or purchased separately. 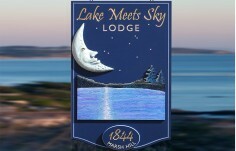 We enjoyed the entire sign project - designing, shape, colors, size, font - because the web site gave us such a true picture of what the sign would look like. And your staff were always ready to help if we had questions. I am sure we could have found someone locally to design it for us, but this was really more fun. It is beautifully made and arrived in excellent packaging - shipped a long way without so much as a nick.